I wanted to share some things that have been on my heart. I don't normally get too personal on my blog but these are some things I have been feeling recently and wanted to share with you all. Sometimes we all need a reminder, to just step back and think about what really is important. 25 is a critical age. Some people are still finding themselves, while some are right on track with their own "life plan". At 25 you're technically classified as a grown up, even though you still may be getting use to doing certain "grown up" things. We begin to make certain life investments through work, family, friends, and community activities. By 25, some friends are probably getting engaged, married and/or possibly starting to have children. Some days I still feel like a high-schooler; young, naive, still trying to pave my way through life. Up to this point in my life, I have had a fair share of life experiences, good + bad and I know that there are many more to come (both making me feel terrified and exhilarated at the same time). Do I some days get discouraged? Yes! But these are some things that keep me grounded and that I always try to remind myself of. As little girls, we grow up watching all sorts of fairy tales. You know how the story goes, there is a princess, she somehow finds herself in despair, only to be rescued by her prince and then they lived happily ever after. For some of us, maybe that has happened. I like to think that I have found my prince, but what about the after part? But the thing is, our lives aren't a movie. Throughout life, things are going to happen along the way, some good, some bad. God has a plan for all of our lives and we have to remember that our happily ever after will come one way or another. Even though sometimes it can be drastically different from how someone else's may seem. More times than most, I've found myself comparing my life to other's. Somewhere I remember reading the quote, "Don't compare your beginning, to someone else's middle." We are all at different stages in our lives, our careers, and our relationships. Still, it is hard to sit there and not compare ourselves and think, Why don't I have that? Why hasn't this happened for me yet? Why? Why? Why?. For me, it took a lot of prayer and realization that I'm where I'm suppose to be, I'm doing what I'm suppose to be, and in time these things too, will happen for me. There are always going to be those who have more, do more and that's okay. Just remember you're where you are suppose to be, celebrate that! Humility is a character trait I strive to practice daily. Everyone is facing a struggle, whether we know it our not. We all have stresses and most certainly have all had bad days. It's important to always be patient, caring, encouraging, and lastly apologetic. Be thankful for the life you have, because there are always going to be those who have a life much worse than yours. "Don't do anything from selfish ambition or from a cheap desire to boast, but be humble toward one another, always considering others better than yourselves. And look out for one another's interests, not just for your own." Whew, is this not true! I like to think of myself as a planner. Sure, I love being spontaneous and flying by the seat of my pants, but I still like for things to be organized...maybe it's the OCD in me, who knows? I love lists, I love organizing, I love just having things planned out. For me, sometime in college I sat down and realized, life doesn't always go as planned. There is always going to be something added to your list, taken off your list, and so on. Your list will grow and it will shrink, it will change drastically, and sometimes who knows..you may even lose your list and have to start all over again. The thing about lists and plans are, normally when we make them, we aren't really the ones that control their outcome. Yeah, we can try our best to make things happen as planned, but so many of the things we do are out of our control. We all encounter things that aren't suppose to happen. Life happens, Plans change, but God is still there. Well of course, life is serious and obviously there are those moments when we should be cool, calm, collected and serious. But life is also fun! It is about taking risks, breaking the rules (sometimes), being spontaneous and creating your own adventure. Laugh at yourself, and with others, it really is the best medicine. When you take life too seriously, and worry about perfecting those tiny things (that in the end may not even matter), you miss out on a profound amount of joy. should I tell you now or later, that its pretty much the same at 27?! I too, sometimes think who is letting me run my life, I cannot that responsible. don't be overwhelmed or under joyed, your life and experiences are as important as anyone else. I think that at every age in life you think you should be doing something other than what you are doing. 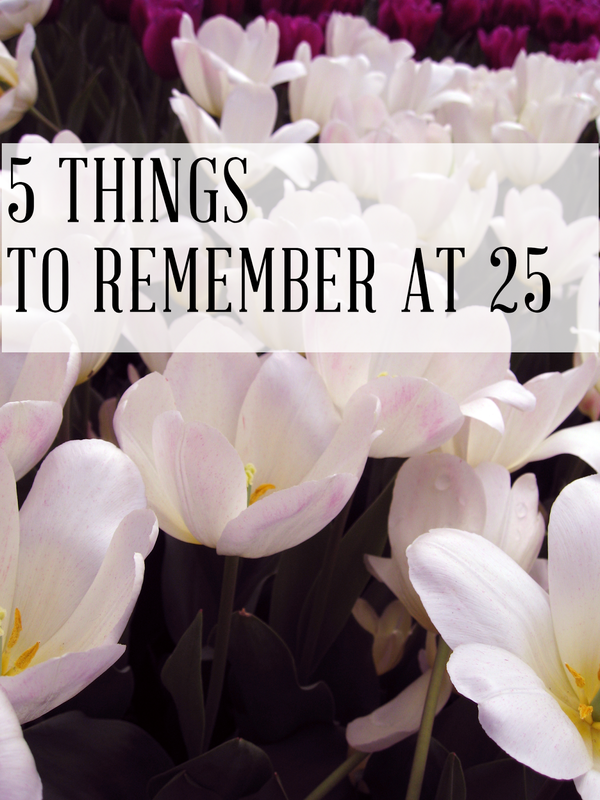 Personally 25 was the worst year of my life - had to go through a lot of crap. However it made me stronger and pretty okay that my "plans" were getting a bit skewed. #5 is perfect advice, don't take it too seriously and watch the amazing things that happen when you don't! Number 4 is always a struggle for me! I'm such a control freak. I really love this! Great food for thought even at 20. All really good lessons at any age, especially #2! Just scrolling through Instagram, it's easy to get caught up in the comparison game.